Another awesome product sneak peak from the wizards at Carli Suspension! This is a prototype stabilizer shock that Sage has been working. It uses a stainless steel body, anodized aluminum mounts with FK rod ends and a nitride hardened steel shaft. This will be a Carli exclusive part that offers the ultimate in corrosion resistance. This new part will have to see some extensive testing before Carli will stamp it done. Pricing won't be much more that the Bilstein based clear powdercoated stabilizers that are already offered. We'll keep you posted as to when these will be available although it won't be very soon. Re: New Carli Stablizer Sneak Peak! Very cool. Thanks for the preview George. Sounds like it will be durable. Definitely a good idea...especially for those of us with stabilizers that will see all kinds of winter salt, lava rock and grime. "Born at the junction of form & function"
2012 PW ST wrote: Very cool. Thanks for the preview George. Sounds like it will be durable. This is a good starting point for a possible future for a stainless shock line up. But like all things Carli it will have to be tested and proven before any steps are taken towards production. They would corner the market in my neck of the woods. The rust belt people would sure like a nice shinny SS shock, to look & perform like new for more than 1 year. They've got a few in testing right now. One is on a truck that spends a lot of time on the beach. The other was tied to rope and tossed into the ocean an tied to the pier. So far the stainless body and the shaft are holding up great. Obviously the bearings on the ends are showing some signs of corrosion but that is generally combated with a little squirt of WD40 from time to time. Skyd Ram - Here is a question: Is there any way that they could make a SSteel bolt type deal with the taper, so this could be used on trucks like mine with the old Y style steering ? I am really digging these but they prob wont work on my truck. 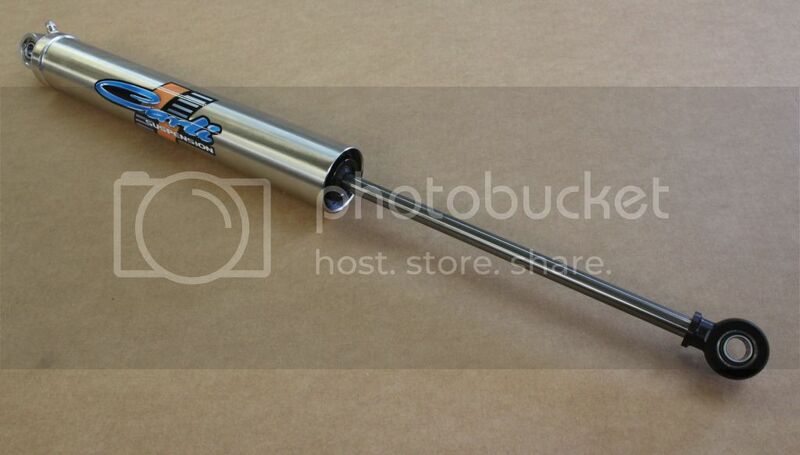 TwinStick wrote: Skyd Ram - Here is a question: Is there any way that they could make a SSteel bolt type deal with the taper, so this could be used on trucks like mine with the old Y style steering ? I am really digging these but they prob wont work on my truck. Unfortunately even with the correct mounting adaptors, the attachment points on the older steering setup is a bit too short for a stabilizer like this as well as the Bilstein 7100 that they currently use. Knowing this, the factory replacement part will probably be $500 !!! TwinStick wrote: Knowing this, the factory replacement part will probably be $500 !!! About $160. That's what I paid for mine when I did the 'T' linkage up grade. Skyd Ram wrote: They've got a few in testing right now. One is on a truck that spends a lot of time on the beach. The other was tied to rope and tossed into the ocean an tied to the pier. So far the stainless body and the shaft are holding up great. Obviously the bearings on the ends are showing some signs of corrosion but that is generally combated with a little squirt of WD40 from time to time. So does that mean we should be spraying WD40 on our current Carli bearings? LOL! Can we use that on the exposed tie rod and draglink threads? Thanks, gentlemen. With all the salt we get in MI, NY, PA, and the rest of the northern states and Canada, we need a 5 gallon bucket of that stuff. I'm ordering 2 spray cans. They go quick. You should order a case. 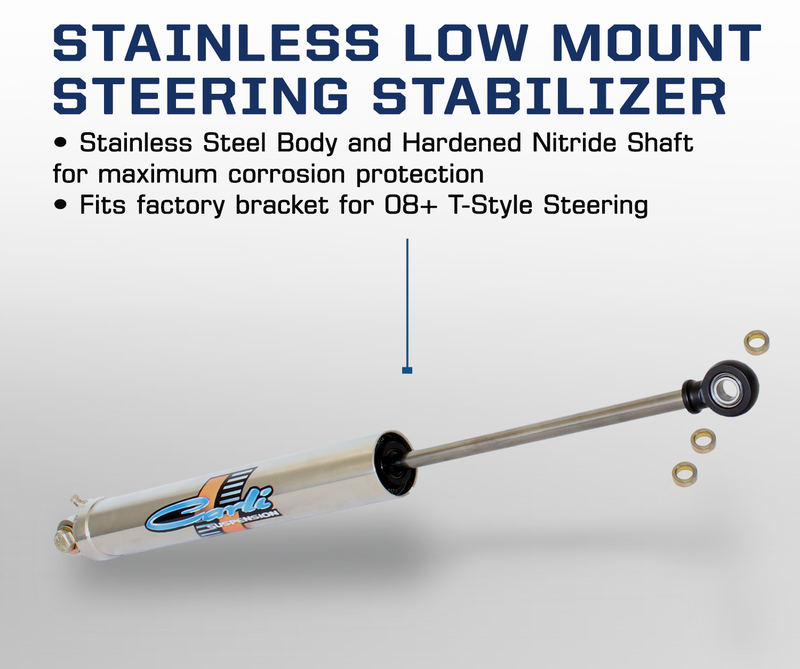 Carli now has this stabilizer available for the trucks with the older Y-style steering. It runs $299 and comes with a new anodized billet clamp and hardware. We are running one on Tommy's (employee) '08 Hemi 2500 with great success!